Dubalgundi, a village in Bidar, with a population of 11909 and 1706 households, houses the Gram Panchayat, a Primary Health centre and many banks. Despite such development, 80% of people in this village have been practising open defecation for the past many years. Many families in the village are well to do, but have not constructed toilets in the households due to myths and misconceptions. In the absence of toilets, women, children and old people are the most affected ones. They have no privacy and have to wait either for dawn or dusk and face the threat of stray dogs, pigs, snakes etc. in the dark. They are also ridiculed by road commuters. The practice of waiting for appropriate time to go out for defecation have led to problems such as constipation, stomach pain and other gastric problems. It is especially cumbersome for women during any illness, diarrhoea, menstruation, pregnancy and post-delivery. 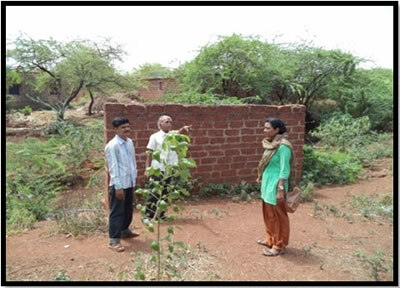 Dubalgundi village has four public toilets in the village that are built by the Gram Panchayat. When the team asked the women why they did not use the public toilets, most responded that there was no water supply in the toilets. 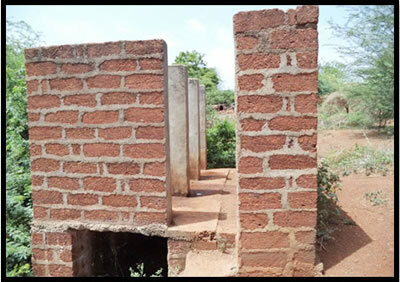 Lack of water supply and improper maintenance rendered the public toilets unfit for usage. Also, the public toilets were roofless which caused difficulty for women during rainy as well in summer season. Myrada, with the support of SDTT, is working in the village for the past one and half years to improve primary health care in the region. Improving environmental sanitation and safe water supply is an important component of primary health care and program commitment. The team had a detailed discussion with gram panchayat chairman Mrs.Padmavati and other members to make a detailed action plan. After careful need based assessment, Myrada agreed to install Galvanised Iron sheets and water tank in two public toilets in ward no. 1 and ward no. 3. As per the agreed terms MYRADA signed an MOU with the gram panchayat for maintenance of public toilets and support for regular water supply. The gram panchayat and Myrada prepared a budget estimate, purchased the necessary material and installed the G.I sheets and water tank. The total expenditure for renovation of two public toilets amounted to Rs. 50000. 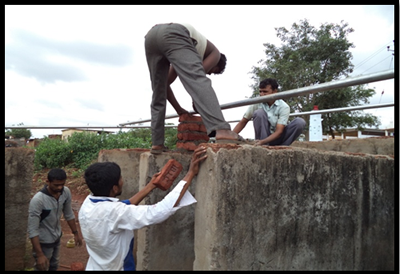 Myrada paid for the materials (GI Sheets and water tank) while the labour was paid for by the Gram Panchayat. Currently 185 and 250 women in ward no.1 and ward no. 3 respectively are enjoying the benefits of clean and hygienic public toilets near to their homes. The women say they feel safer now and are utilizing the toilets at any hour of the day without any inhibitions. The intervention has brought shade during summer, protection during rain and regular water supply in the toilets. The community members especially women and young girls have expressed their gratitude towards Myrada. This move has increased the awareness among community and the gram panchayat. They now show a willingness to construct many more such public toilets in the best interests of the community. MYRADA plans to replicate this intervention in other districts under SDTT project wherever there is a need.